For farm safety & security, the street address & phone number are available upon request. I love to talk about Fell Ponies! Whether you have general questions, specific questions, comments- I'd love to hear from you. Contact me directly for pricing on ponies that are available for purchase. 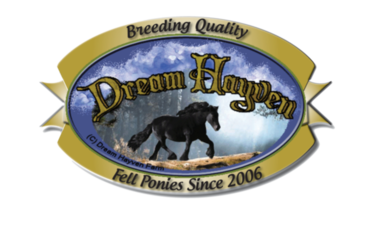 Email is the easiest way to reach me (info at dreamhayven dot com). I also publish up-to-date news & info on the farm thru Facebook. I have included a handy link, below to the right. Please 'Like' my Page if you visit! IMPORTANT! I answer every email. If you don't receive my reply, check your spam or blocked senders list.